Peaceful fish that can be kept in combination with other fishes from Lake Tanganyika. The aquarium should be set up with rocks with a lot of caves. Some plants may be useful. You should feed them with live food. Frozen food (like Artmia) is accepted as well. Breeding is very easy. The eggs (200-300) are laid and fertilized in a cave. Both parents take care of the fry. After a few days they hatch. You can feed them with baby brine shrimp. When the young get older they may stay in the territory of the parents like a family. The best method for keeping Neolamprologus brichardi is in a species-only tank. A tank as small as 55 ltrs can be utilized, though between 75 and 110 ltrs would be more appropriate. By keeping this fish on its own, not only do you limit the chance they will eliminate their tankmates, but their graceful finnage will likely grow better. That is not to say that it is impossible to keep this fish with other Tanganyikans, but one must be careful in selecting tankmates, and the aquarium best be at least 90 cm long, with a 120 cm tank being preferable. 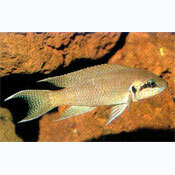 Some commonly available fish that should be compatible would include: Neolamprologus leleupi, cylindricus; Altolamprologus calvus, compressiceps; Julidochromis marlieri or regani. There is, however, a bit of a secret to making this work. Any other tankmates must be much larger than the brichardi to begin with and they must establish their territory in the aquarium first. Purchasing an adult pair of calvus and juvenile brichardi would be an example of a situation that would normally work out. There is one important caveat: in a tank of less than 120cm you would be limited to two pairs of fish when including brichardi in the mix, though this may not even be successful. Rockwork must be firmly anchored as these fish are diggers that may topple rock structures, damaging the tank or themselves. Plants may be included, although they are subject to uprooting by the cichlids.